As you read this, I'm sitting in the movie theatre, wishing Frost Giants would ice the talkers behind me, and ready to watch Thor: The Dark World. 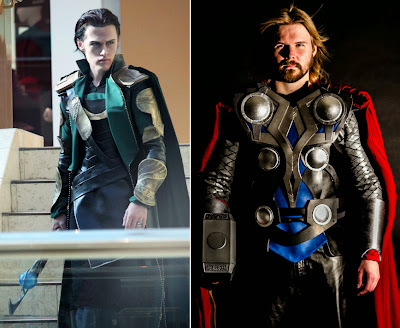 While I'll be staying glued to my seat until the end of both post-credit sequences, here are a few Asgardian mad cosplayers who wouldn't look out of place in the seats beside me. Now if you ask me a large chunk of cool that goes uncredited from the first Thor film, is guardian of the bridge, Heimdall. Especially when you see his size in ratio to his fellow Asguardians! This cosplayer carries his imposing glare - and one a hell of a sword too! Lady Loki is a deviantArtist you can't forget. In the amazing Thor relaunch written by JMS, Loki grabs the body of Lady Sif (who no one recognizes as possessed despite being Thor's ex). Allied with Doctor Doom and Hela, he/she gets Thor banished, in true classic Loki style. Though, if it inspired this kind of fan follow through, JMS should never have been allowed to leave the title! 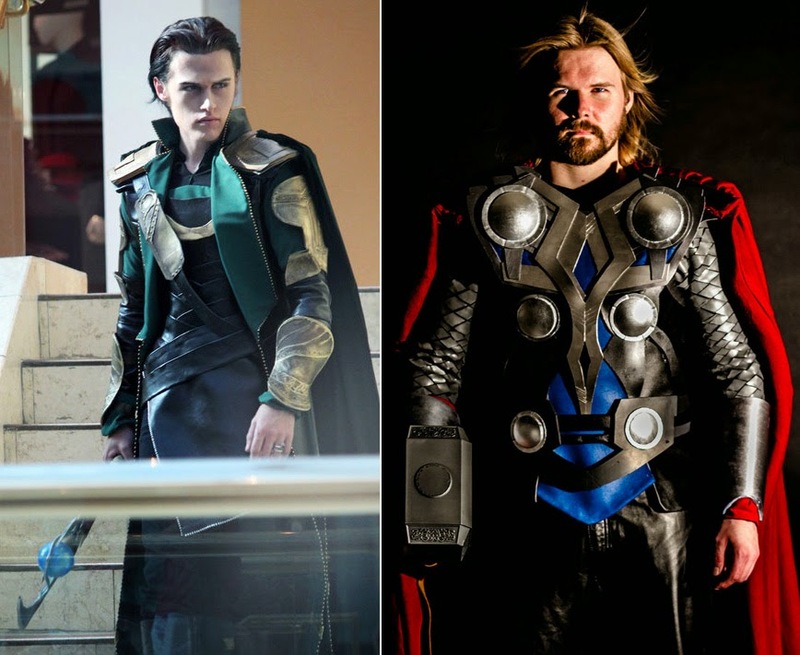 Sylar got to cosplay as Loki, thanks to a costume by Riku Ryou, and the man doesn't waste a second slipping into character! Dusty Lofink is a Californian fan of the Thunder God, that didn't let his love of surfing get in the way of capturing Thor's manscaped looks! He's also cosplayed as Sid Highwind from Final Fantasy VII, so the guy knows great high-flying characters when he sees them! 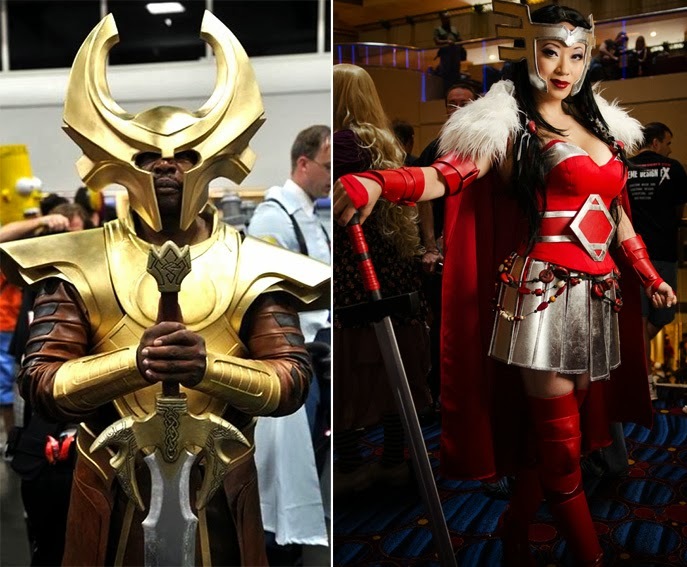 Heimdall is a fabulously good cosplay- but then all the Asgardian Gods/characters are ripe for over-the-top costume makers. Hey, enjoy the movie! I adore that Heimdall. Almost as much as I loved the one in the movie. Have fun tonight, and sneak me some video! Hey Aliera, welcome back :) Always good to see your name pop up and as you can see, your mates are all still here. Thanks Karl and Random! Our theatres even had official Thor 3D glasses on sale for $7 above the usual 3D glasses sale price. Thor still didn't throw his hammer directly at audiences. I thought with 3D that would be an obvious shot. Yeah, they always squeal first.. the whole wanting you to live legally thing. Piff! My husband made that joke! At the ticket office he said he wanted a seat behind so he could video the movie! I was so embarrassed! Lol hardcase Aliera. I'm sure after that they had one security camera focused on you two all night!